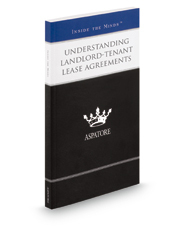 Understanding Landlord-Tenant Lease Agreements discusses fundamental aspects of landlord-tenant lease agreements. For landlord and tenant alike, the first step before engaging in any lease agreement is to evaluate each party's respective goals on the material terms and conditions of the commercial or residential lease. Coupled with this analysis must be a complete assessment of one's willingness to enter into the agreement with this specific partner – as well as a thorough review of one's leverage and willingness to "walk away" from the deal.